In what can only be explained as the shortest solicit in the history of major characters, Marvel has told us very little about this book. A few days ago, Marvel felt the need to finally release a “trailer” for this limited series. Explaining that Charles Soule so rudely took Wolverine away from us in Death of Wolverine. 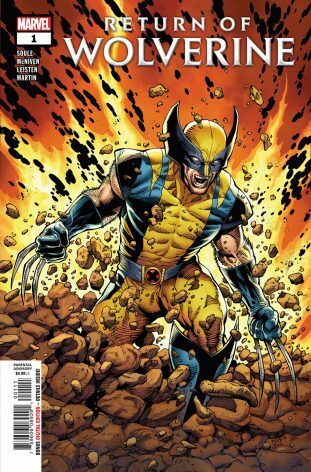 Now he’s going back on his own story with Wolverine’s resurrection. If you’re looking for immediately clarity into the fate of Wolverine, take a breath. He starts this book in a dazed and confused state. Memories and flashbacks are the name of the game here. Wolverine is told by someone that he may or may not have maimed to look for Persephone. She did this. As a result, everything goes straight to hell. Wolverine is attacked by a sabretooth tiger. He’s blown up. He runs out of his personal hell to find a camp. A guard is shooting people. Wolverine’s basic instinct to protect people starts to kick in. I was all in with the Death Of Wolverine way back in 2014. It’s a well written and memorable send-off for a well-loved character. And then there was nothing. That is until we started to hear rumors of a return. Then we got some rather odd books. We reviewed some of them here and here. Hunt For Wolverine was certainly not a straight line course back to his return. However, this book has a welcome feeling and tone for this character. The art is certainly indicative of the dark and confused state. In addition, the colors are fiery in the early parts of this book. As Wolverine gets more clarity, the look becomes more grounded and clear. If this transitional style is used throughout the series – Charles Soule will have no problem keeping the readers’ attention. The book is a little overdone on the variants available at launch but the content is well worth your time and money.